An airship or dirigible is a type of aerostat or “lighter-than-air aircraft” that can be steered and propelled through the air using rudders and propellers or other thrust mechanisms. Unlike aerodynamic aircraft such as fixed-wing aircraft and helicopters, which produce lift by moving a wing through the air, aerostatic aircraft, such as airships and hot air balloons, stay aloft by filling a large cavity with a lifting gas or hot air. The main types of airship are non-rigid (or blimps), semi-rigid and rigid. Blimps are small airships without internal skeletons. Semi-rigid airships are slightly larger and have some form of internal support such as a fixed keel. Rigid airships with full skeletons, such as the huge Zeppelin transoceanic models. Metal-clad airships were of two kinds: rigid and non-rigid. Each kind used a thin gastight metal envelope, rather than the usual rubber-coated fabric envelope. Only four metal-clad ships are known to have been built, and only two actually flew: The Hungarian David Schwarz’s first aluminum rigid airship of 1893 collapsed, while his second flew; the non-rigid ZMC-2 flew 1929 to 1941; while the 1929 non-rigid Slate “City of Glendale” collapsed on its first flight attempt. 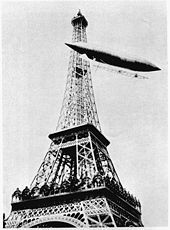 After Schwarz’s death, his wife, Melanie Schwarz, was paid 15,000 marks by Count Ferdinand von Zeppelin for information about the airship. Several companies build hot-air airships. These combine the structures of both hot-air balloons and small airships. 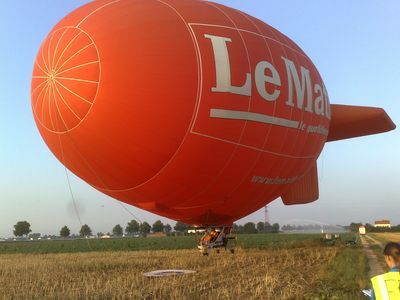 The envelope is the normal ‘cigar’ shape, complete with tail fins, but is inflated with hot air (as in a balloon) to provide the lifting force, instead of helium. 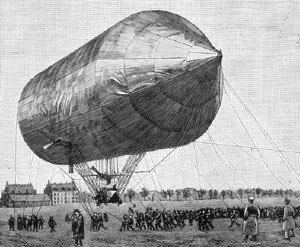 A small gondola, carrying the pilot and passengers, a small engine, and the burners to provide the hot air are suspended below the envelope, below an opening through which the burners protrude. Hot-air airships typically cost less to buy and maintain than modern helium-based blimps, and can be quickly deflated after flights. This makes them easy to carry in trailers or trucks and inexpensive to store. They are usually very slow moving, with a typical top speed of 25–30 km/h (15–20 mph, 6.7–8.9 m/s). They are mainly used for advertising, but at least one has been used in rainforests for wildlife observation, as they can be easily transported to remote areas.